The festive scene was set by the staff of the Victoria Hotel where the room was beautifully decorated with a large Christmas tree, decorations, and Christmas scented candles which put everyone in a festive mood. The first property to be sold was No 56 Tara Grove, Wellpark, a well maintained spacious four bedroom semi in a very popular residential estate within walking distance of Eyre Square. While bidding was a little slow to open a couple to the front of the auction room were first to declare their interest, followed by a man standing at the very back of the room who appeared to be taking his instructions by phone. In what proved to be a very tense five minutes with more than 25 individual bids, the property was eventually successfully secured by the man at the back of the room for €285,000, followed by spontaneous applause from the packed auction room. Next to sell was No 1 Beechwood Park, Ballybane, a large, distinctive, four bed detached house on the main Ballybane Road close to GMIT. Again bidding was very slow to open, and it appeared to many that there were no buyers for this property as after two minutes there was no bid. However the auctioneer used all his experience and awareness of the interest in this property to persist, refusing to withdraw before eventually getting an opening offer of €265,000. Even then it appeared there was only one bidder, and it was another minute before two further bidders declared their interest resulting in the property eventually selling for €287,000, well in excess of its guide. One property which exceeded all expectations was No 8 An Lochan, Headford Road. This three bedroom second floor apartment had generated considerable interest in the weeks prior to auction with queues forming outside at each of the open viewings. Bidding opened at €125,000 with five bidders quickly declaring their interest. While on a number of occasions it looked like the property was sold, Don Colleran delayed dropping the gavel, encouraging the under bidders to go again, which they did. More than 20 bids later the property was secured for €175,000 much to the delight of the vendor. The last property to sell was No 11 Ardilaun Road, Newcastle, a large three bedroom detached home tucked away in quiet cul-de-sac with a lovely sun filled south facing back garden at the rear of the hospital and close to the university. This property did not initially achieve its reserve at the podium and was withdrawn but sold immediately afterwards for well in excess of its AMV €280,000. No 18 Emmet Avenue, Mervue, saw tremendous interest from both first time buyers and investors prior to auction but did not reach its reserve. This three bedroom terrace house in the heart of Old Mervue, one of Galway's longest established and most popular estates with every amenity on the doorstep, is now available for sale by private treaty at a very attractive price of €230,000, and immediate viewing is recommended. 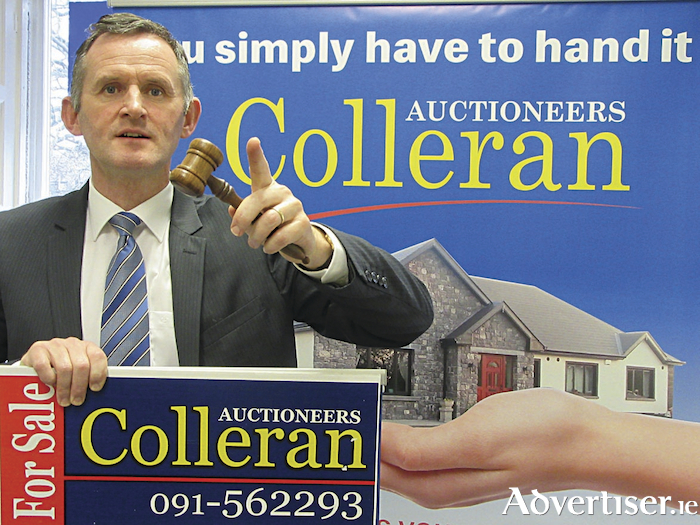 After the auction Don Colleran reported that his clients were extremely pleased with the success of the auction but that he now had a large number of disappointed bidders anxious to purchase similar properties. If you are thinking of selling your property in or around Galway city centre contact Colleran's for a free sales valuation.